Not a particularly ‘good’ photo for the blog this week from me, but a significant one nonetheless. 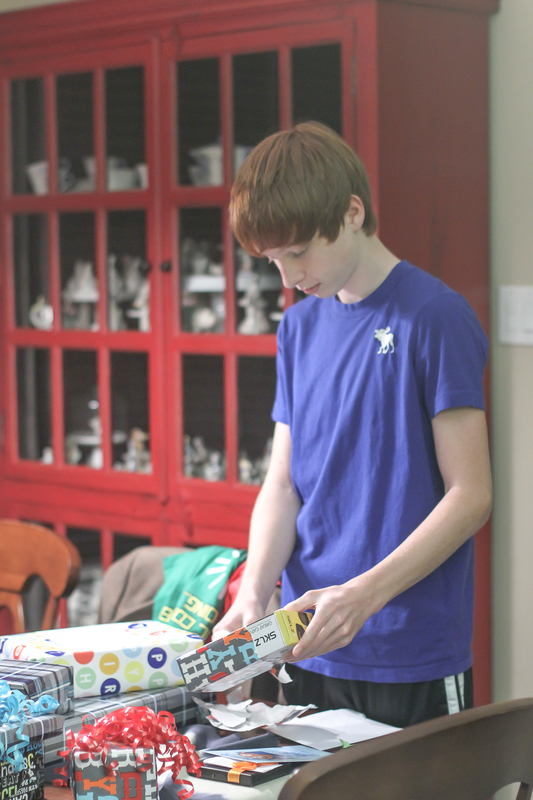 On 11-12-13 this year, my eldest son Jack turned 14. He was born in Exeter, in England, and we moved to Houston when he was 15 months old. Sometimes I try to imagine what my kids would be like if we had stayed in the UK, but I think that Jack was destined to be a Texan. In a state where red heads are cherished, my boy with his southern drawl, love of football, and fondness of the heat, shorts, and flip flops, fits in just about perfectly! I took this photograph at around 6 in the evening in our kitchen in full artificial light. I used my Canon DSLR paired with my 50mm 1.4 lens, with my settings at ISO 1600, shutter speed 1/100, and aperture f/2.0. Post processing in Lightroom 4 I initially cropped in the image, increased the exposure but decreased the contrast, decreased the shadows and blacks and increased the clarity. Finally, I adjusted the sharpening and noise reduction in the picture. ‘Indoors’ at our local subway stop reading,”Murder on the Orient Express” by Agatha Christie. We actually created this photo for the Project Life 365 prompt, #currently_reading. This is a prompt that has shown up almost every month over the past year, and a hash-tag that I will miss the most. I have really enjoyed creating images around the books my kids were reading. With one child in sixth grade and the other in eighth, they are finding themselves immersed in the classics, with each new book becoming their new favorite. This photo was taken with my Canon DSLR using my 35 mm 1.8 lens. The lighting in an underground subway station is not particularly good, so I adjusted my settings accordingly. My ISO was at 1600, the aperture at 1.8 and my shutter speed at 1/100. The edit was done in Lightroom where I sharpened the radius, increased the luminance and applied a black and white (sucre noir) Rebel Sauce preset. For a better view of the image, just click on the photo above.